Tocopherol is commonly referred to generically as vitamin E because vitamin E is typically made up of tocopherol and other similar substances. It is a naturally occurring compound present in a variety of different food such as sunflower seeds, hazelnuts, almonds and fruit and veg like mango, avocado and broccoli. The most common form of tocopherol is alpha- tocopherol. It acts as a natural antioxidant in the body helping to eliminate free radical damage while it also plays a vital role in many organ functions. It can help slow down the aging process and help treat a variety of conditions from heart disease to high blood pressure. What are the Health benefits of Tocopherol? Tocopherol can help balance cholesterol levels which has a positive knock on effect on your health including the prevention of heart disease. Cholesterol is produced naturally by your liver and is important for many bodily processes to function properly including the nerves, hormones and cells. However, when cholesterol oxidizes, it can become very dangerous to our health. Various studies have demonstrated that vitamin E can help fight cholesterol oxidation by working as a natural antioxidant. It helps to fight the free radical damage which can result in cholesterol becoming oxidized thus protecting your overall health. Our exposure to environmental pollutants, household chemicals and even our food means that it is almost impossible to avoid contact with harmful free radicals. These free radicals cause our healthy cells to break down which can result in extremely serious conditions like cancer and heart disease. Tocopherol is a potent antioxidant which can help prevent and fight the damage caused by free radicals. It can help prevent inflammation and slow down the body’s entire aging process but can also help to stave off specific complaints like cancer or cardiovascular disease. Tocopherol may also help to speed up the skin’s healing process following injury or sunburn. It gets absorbed into the skin’s epidermal layers which makes it ideal for treating irritation or sunburn. And that is not all; because of its excellent antioxidant abilities which help regenerate the cells, tocopherol can help treat skin conditions like acne and eczema and even help diminish the appearance of scars and wrinkles. The same antioxidant powers that help the body and skin so much apply equally to the hair. It can help stimulate and boost circulation to your scalp and topical oils containing vitamin E can be used to help you retain your natural moisture preventing the scalp from becoming flaky and dry. Tocopherol’s ability to inhibit the damage done by free radicals can also help to maintain the body’s immune system which will protect you from annoying illnesses like the cold and more serious diseases. It can also help the body repair its DNA and enhance bolster its metabolism. Consuming tocopherol and vitamin E also hinders the production of carcinogens like nitrosamines formed by nitrates contained in certain types of food. 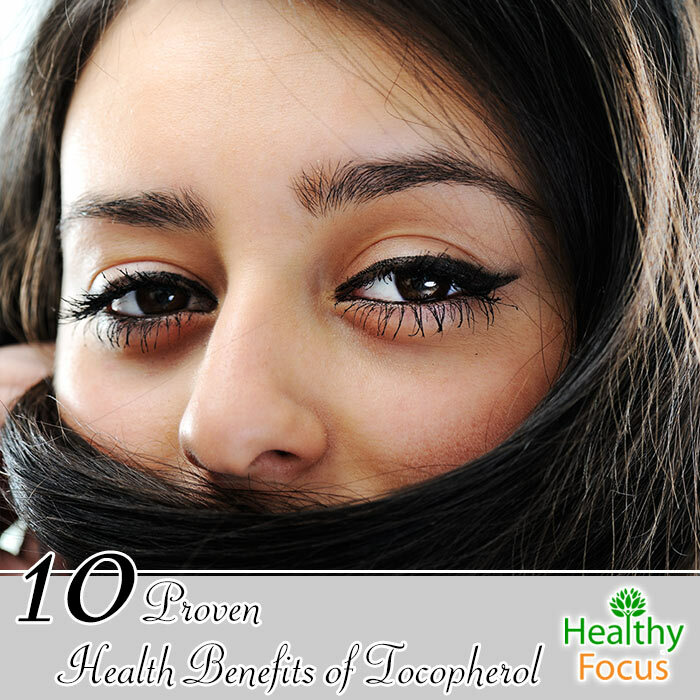 Tocopherol can help improve the overall health of your eyes and also protect against macular degeneration. It is important to remember that for vitamin E to have the best effects on your vision that it should be augmented with sufficient amounts of vitamin C as well as zinc and beta carotene. There is also some evidence that that taking high doses of vitamin e in combination with vitamin A may help the vision of people following eye surgery. Vitamin E may also help the health of your nervous and endocrine systems which in turn helps to keep your body’s hormones balanced. This is crucial since symptoms of hormonal imbalance can be quite serious. Among these symptoms are weight gain, PMS, anxiety, weight gain, allergies fatigue and infections of the urinary tract. If you keep these hormones in balance, you reduce the risk of many of these unwanted side effects and will feel overall more energetic and in better health. Tocopherol helps battle fatigue by promoting better blood circulation and strengthening the capillary walls which nourishes the cells. Supplementing with tocopherol several days before menstruation and 2 or 3 days following your period can help reduce many of the unwanted but all too familiar symptoms of menstruation. These include anxiety, moodiness, cramping and cravings. Tocopherol may also help to relieve the severity of pain and its duration and can also help to reduce blood loss during menstruation. As we have already mentioned, because tocopherol can help balance the hormones, it can also help regulate the menstrual cycle. As always, it is better to get your vitamins through your regular diet than to rely on supplementation. It should not be difficult to achieve your recommended daily value by eating a varied diet rich in nuts, fruit and vegetables. The recommended daily value for vitamin E is 20 mg.
Because of the fact that tocopherol (vitamin E) is fat soluble, supplements will work better if they are absorbed along with food. It is certainly best to get your antioxidants from dietary sources as recommended by the Heart Association of America. Try to eat a well-balanced and healthy diets full of fruit and fresh green vegetables. It should not be difficult to achieve your recommended daily value and it is also very difficult to go beyond the upper safe limits when you are getting your vitamins from a food source.